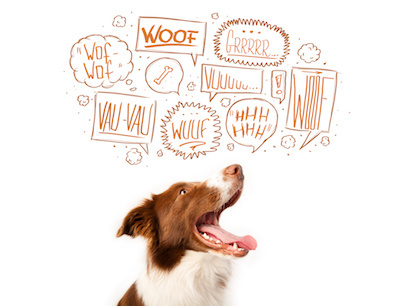 At the simplest level, dogs bark to communicate. Your dog’s bark is just as unique as your voice! Interestingly, I can pick out my dog’s bark from a kennel full of other barking dogs. I also, typically, can tell what they are trying to communicate through the tone of their bark. I know when my male dog is frustrated at being left outside at night because he yips. I can also tell when he thinks someone is too close to our yard. I also know his excited bark. All of these barks are used to give me information. Different breeds even have different barks. Did you know there is a breed of dog that can’t bark? Although Basenjis can’t bark, they certainly do still make noise! I think the worst bark is the boredom bark. It is a problem because a dog that learns to alleviate boredom by finding joy in barking tends to be very difficult to break from barking. Prevention is always better than trying to deal with a problem barker. This is accomplished by properly training your dog. Although it seems counter-intuitive, getting the barker to bark on command, it is the best way to deal with this behavior. It is essentially getting control over the behavior that you want anyway. Once the dog knows how to bark on command, you can then teach him to be quiet on command. I have a dog that LOOOOOVES to hear herself bark. The nice thing about that is I can ask for it from time to time, but ultimately I have control over it. 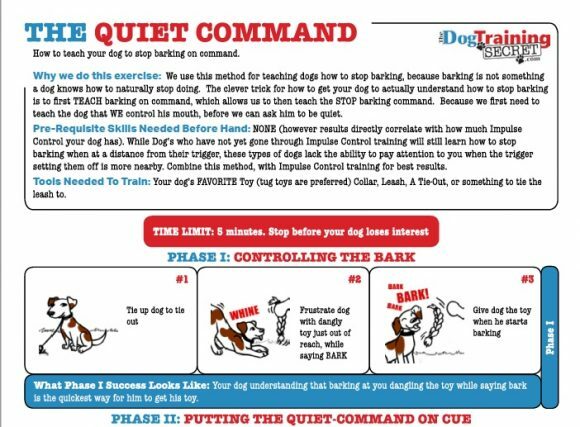 We have actually created a game to help stop your dog from barking. Click here to download the next step of the Quiet Command. Other than putting it on cue and rewarding the behavior when you ask, as mentioned above, be very careful that you aren’t inadvertently rewarding the behavior. I house-sit for a very difficult dog. He likes to stick his toys under the couch just out of his reach, and then he barks in my face. It is clear that his owners get up and move the couch when he barks at them. Yelling isn’t going to help. Remain calm and make sure that the barking equals something that the dog doesn’t want. For example: if the dog barks for attention, then putting him outside or somewhere else will teach him to be quiet if it equals something that he doesn’t want. Exercise, exercise, exercise! Your dog needs it! If he is driving you crazy with his barking, it is probably a hint that he lacks the appropriate amount of exercise and mental stimulation!